Taxi: You can take a taxi to Hua Hin. Bus: You can travel bus from the ground floor of the airport terminal building to Hua Hin. The bus service is operated by Bell Travel. Passengers are required to to check in at the large ticket counter on the Ground Floor for services to Pattaya & Hua Hin. The counter is very easy to identify because it is in the centre of the ground floor lobby of the airport next to Gate 8, which is the closest door to the bus stop in front of the airport. Check in 15 minutes before departure with your electronic booking voucher. From January 2017 Bell Travel decided to only accept online bookings. You cannot buy a ticket on arrival in Thailand anymore. Bell Travel uses 24 seat micro-buses on this route. A micro-bus is a smaller version of normal bus. These micro-buses have toilets and water is provided to customers free of charge. Travel Tip: The air-conditioning in these micro-buses is very powerful so bring a light sweater or thin blank as it will make your journey more comfortable. Use the Search Box below to book both taxis and bus tickets from Suvarnabhumi Airport to Hua Hin. Find the best travel times. Secure online booking and instant ticket confirmation. After booking you will be sent an electronic booking voucher which you should print out and keep. You will need to present the booking voucher and Photo ID before you board the taxi or bus for the journey to Hua Hin. There are two way to get a taxi from Suvarnabhumi International Airport to Hua Hin: basically you have a choice between paying to pre-book a taxi or taking a chance on being able to negotiate a fair deal when you arrive at the airport. Public Taxi: Use the queuing system. There are ticket machines in front of the airport. You queue to take a ticket and with the number of a taxi bay. Once you have your ticket you walk until you have located the correct taxi bay. Each taxi bay has a sign with a number. Once you have reached the allocated taxi you then need to negotiate a price for your trip to Hua Hin. If you fail to agree a price you need to return to the ticket machines and repeat the process over again until you are successful. Private Taxi Hire: Alternatively, you can book a taxi online before you arrive at Suvarnabhumi International Airport. The driver will be waiting for you in the Airport. The cheapest online taxi service from Suvarnabhumi International Airport to Hua Hin is provided by Hua Hin Cars. The Bell Travel service from Bangkok International Airport terminates at the Roong Reuang Bus Station, which is 11.6 km by road from the Clock Tower in the centre of Hua Hin. 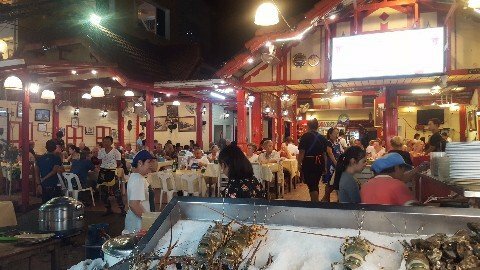 The journey from the Roong Reuang Bus Station to popular destination in Hua Hin town centre such as the Night Market is straightforward because the bus is on the Phet Kasem Road, which the main road running through Hua Hin town. From the bus station you need to take a private or shared taxi depending on your end destination. If your hotel is is near to the town centre and the night market you can travel easily and cheaply from the bus station by shared taxi.